Microsoft recently released a big new Xbox One update to the public after testing it within the Insider Program earlier this year. This is the Xbox equivalent of the Windows 10 Creators Update due on April 11th, which will also bring Beam integration and Windows 10 Game Mode. Take a look at the main features of the Xbox One update below. An updated look at Home: One of the first things you’ll notice with this update is a new look for Home on Xbox One. We made these changes to simplify the UI and increase overall system performance. To do that, we’ve optimized for speed and are prioritizing the most valuable content for your games. Now, you’ll see a smaller icon for the game with options to dive deeper into the community surrounding the game, as well as the ability to interact with your Club or find Looking for Group posts, view your Achievements and more. If you do not have a custom background set, you’ll see that the updated Home also spotlights the game you’re currently playing by featuring hero art as your Xbox background. Faster and more intuitive Guide: The next thing you’re likely to notice is that the Guide has been updated. With one press of the Xbox button on your controller, you can now pull up the newly enhanced Guide as an overlay on the left side of your screen. No matter what you’re doing, the new Guide experience puts the features and functionality that you use the most right at your fingertips. The first page of the Guide is designed to get you to the content you care about most, including your Games and Apps, Home, Store, your recently launched applications, the latest Games and Deals with Gold for Xbox Live Gold members, and your top Pins. If you have music playing in the background from any number of apps, you can access the controls directly from the Guide, enabling you to control play, pause, rewind, fast forward, and manage volume controls. Finally, you’ll be able to capture screenshots and record video with a simple press of a button. And in the GameDVR menu, you now have easier access to capture gameplay and to modify your options – when recording, you’ll see in the menu overlay that it lasts up to 5 minutes and within the Guide, you can also ‘Record this’ for up to 10 minutes. New way to multitask: In addition to adding a new start page to Guide, we’re also evolving the way gamers multitask on Xbox One. To simplify discoverability and to make it easier to get to the things you care about most, our multitasking features were designed with the new Guide in mind. We’ve added a new achievement tracker that is active based on the game you’re playing, and allows you to select and follow multiple achievements in an overlay, all while you’re playing. Cortana will also appear as an overlay on your screen, allowing you to set reminders and alarms, access Party controls, and play music with simple voice controls. 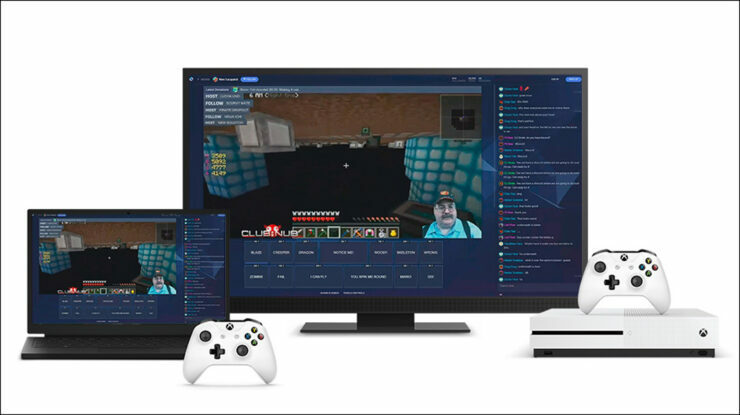 Watch, chat and interact with Beam on Xbox One: We’re committed to making great gaming experiences that unify players across the Xbox One console and PC. Beam is a key example of this unification, and is available for console gamers starting today, releasing more broadly to PC gamers on April 11. With Beam, we’re inviting Creators on Windows 10 PC and Xbox One to stream gameplay and interact with the community in near real-time using Beam’s ultra low-latency – no extra hardware or software required. Starting today, you can stream your Xbox gameplay directly from the Guide on your Xbox One, with the ability to manage your Beam broadcasts and interact with fellow gamers on chat overlays that appear on your screen. If you’ve never tried to broadcast your gameplay before, this is the easiest way to get started as you don’t have to download any extra software – Beam broadcasting is built right into your Xbox One. Once you start streaming, Beam makes it easy to connect and engage with your viewers no matter where they are. You’ll also find the new Beam viewing app in My Games and Apps, which lets you watch, chat, and interact with your favorite game streamers in near real-time. To learn more, check out our Beam article.